Most analysis on technology and trends is Enterprise-focused. Fact is virtualization is used by shops of all sizes, and the biggest area of challenge has become storage. IT folks value practical advice and info, some of which applies to everyone, little of which applies to the smallest shops. This live chat from 10:30-11AM EDT on Tuesday 10/30/2012 will be hosted by expert @DavidMDavis of @TrainSignal, VCP5, VCAP-DCA, CCIE, and author of the TrainSignal vSphere video training library, along with Mario Blandini, Chief Evangelist with Drobo. No PPT, several survey questions, lots of analysis and advice from David breaking-down the results of the live poll. Everyone is welcome, and if you are a smaller shop (fewer than 250 users), we especially want your input. 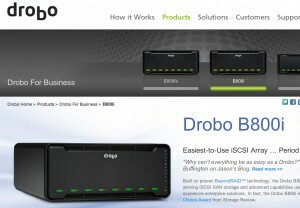 By participating in the live chat and survey, you will be entered to win one of two prizes: 1) a TrainSignal DVD course, & 2) Drobo B800i iSCSI SAN system, a $2,699 value that can store more than 30TB! Perfect for that virtualization lab at home and your personal data / media, or studying up on how to build the virtualization lab!